Southeast Texas, 1969. Robert “Bobby” Dent, 22, and his wife of one year, Ila Fae Holiday, 21, pretended they’d been beaten and robbed in order to steal a policeman’s gun, car, and for good measure, the policeman himself. Bobby sat in the front seat and forced trooper Kenneth Krone, 27, to drive via cocked Magnum to the ribs; Ila Fae stuck the trooper’s shotgun in his ear from the back seat. They had no plan. Soon they were pursued by more than 100 police vehicles and news media, in a ridiculous slow caravan that included stops for gas, restroom, and food. Police Captain Jerry Miller remained in constant radio contact with the fugitives; he wanted to keep Bobby calm so nothing tragic would happen. Bobby eventually agreed to release his hostage if police would allow them to visit Ila Fae’s two children from a previous marriage at their grandparents’ home, and provide a 15-minute head start to escape. You know the story didn’t end well: when they reached the front door, Krone dropped to the ground and Bobby was shot to death by an FBI agent from inside the house. Ila Fae served five months of a five-year sentence. One can see the appeal The Sugarland Express held for Spielberg, after the extended highway chase of his earlier Duel (1971). Adding characters and dialogue to Duel’s pared-down formula makes sense, and Spielberg’s technical mastery continues to grow here. The film was shot in widescreen aperture (2.4:1) and featured the first use of Panavision’s new compact Panaflex cameras – Spielberg made extensive, unprecedented tracking shots within the hijacked police car to cover his three principals. While the movie is technically accomplished and beautifully shot, what’s more interesting is how the true story was changed for the movie. That’s a great description of what Spielberg’s done with his adaptation. He’s pumped up the sensuous elaboration, injecting comedy and pathos. 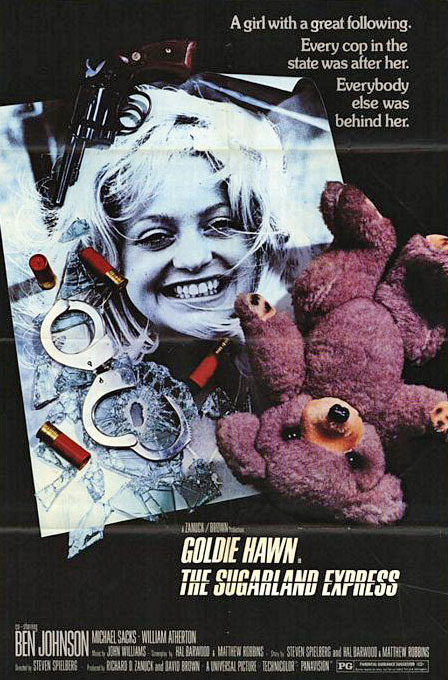 Goldie Hawn’s Lou Jean Poplin (all of the characters were renamed) takes center stage, driving the machinery of the plot through demented willpower. (Roger Ebert wrote of Hawn’s “brilliant vapidity” in the role – she’s excellent.) The movie provides motivation for the journey – the couple’s two year-old son was placed in foster care while both were in jail (on non-violent offenses), and they want to reclaim him. Now, in addition to the hundred-vehicle caravan, Spielberg adds adoring crowds who respond to a mother’s love for her child. Most of this works in cinematic terms, and it predicts a growing American fascination with celebrity and how the media would increasingly cover certain types of events. John Williams’ music echoes Charles Strouse’s work in Bonnie and Clyde as well, at least the during the jaunty folk-tinged parts. Williams also adds a few marches, suggested by the marching bands that come out to celebrate the procession. His most effective moments are the restrained strings he uses to suggest foreboding – they aren’t overplayed, or used melodramatically. They add the right accent at the right moment. The film’s best sequence is when Hawn and her husband, played by William Atherton, watch a drive-in movie from bed in a motor home parked in a used car lot. They have no sound, but Atherton’s character provides his own effects (it’s a Warner Brothers Road Runner cartoon) as Hawn laughs. Gradually, the camera zooms in on his face and the cartoon’s actual soundtrack replaces his voice. We see the film’s image reflected in the glass, superimposed over his face, as the cartoon coyote falls to the canyon floor; Atherton knows, deep down, that a similar fate awaits him. Spielberg’s story sense and technical ability line up perfectly in this great scene. Ben Johnson is very good as the captain leading the chase. Where another movie (or another actor) might make his character a buffoon, Johnson projects weary authority and responsibility. This gives him a compelling arc; we’re told early on that he’s never killed anyone in 18 years on the force, and he wants to keep it that way. He starts to care for the fugitives by the end, and comes to realize that events have escaped his ability to govern them. As the kidnapped trooper, Michael Sacks is likable and sympathetic. His growing affection for his captors gives the audience permission to care for them as well. I liked the movie until the very end. Spielberg might have taken his lead from the true story, or even from Bonnie and Clyde’s devastating climax. Instead, he allows the action to continue far too long, and the tension dwindles. Spielberg might have drawn things out to get two images – first, that broken teddy bear (he also had a few more cars to crash), and second, Michael Sacks standing in silhouette against a reflected sunset as the credits roll (at least the third time Spielberg has finished with that type of image, after Amblin’ and Duel.) The shift in focus doesn’t make sense, after Hawn’s Lou Jean commanded the rest of the film. At the very end, she’s relegated to just a title: the movie makes her serve fifteen months in prison instead of five, and it gives her back her child. Posted in Movies and tagged Movie Reviews, Movies, Spielberg. Bookmark the permalink.